One of the things I like about Langosta beach is that even when you think that you are enjoying a quiet stretch of beach and when you think that you are alone, you often are not alone. There are birds, and if you look closely, you may spot an iguana. This is a baby iguana, not a gecko. We have geckos, but they usually come out night. Iguanas have pointed toes, whereas geckos have little round pads, which them them vertically and even hang upside down. This week we are showing photos of the delightful Majorelle Gardens of Marrakech, Morocco, which were owned for many years by Yves Saint-Laurent, on our Viva la Voyage travel photo site. Catching a surfer in mid air requires either perfect timing with the shutter button, or a good automatic multiple shot feature on a camera, which almost all cameras today have. I do not surf, so I cannot imagine how a surfer attempts to negotiate the point when a wave breaks. Some surfers seem to turn up into the wave and go airborne and then land on the flatter water behind the wave, rather than being churned in the turbulent water of the breaking wave. Maybe this is a metaphor for the political problems that are swirling around the President of Costa Rica. She is trying to pull up and out of the controversy by getting rid of some of her top aides and cabinet ministers. The scandal I talked about yesterday involves intermediaries for the owners of the airplane used by the President for two foreign trips that included a famous Costa Rican football (soccer) star and a person who was introduced to the government officials using a phony name. The airplane was tied to corporate interests in Columbia. I showed some beginning surfers at sunset recently in the small waves of the sheltered southern end of Tamarindo Bay, so today and the next couple of days I will show a very good surfer on Langosta beach. A comment about the news: It seems that the scandal fever that has taken over Washington recently is also occurring in Costa Rica. The President has accepted the resignation of several members of her cabinet and some of her top aides. It turns out that a private plane that the President has used for recent trips to Peru and Venezuela is owned by someone who is under investigation for being linked to people who are possibly involved in drug trafficking. The aides and cabinet ministers involved did not vet the persons involved in the ownership of the airplane. The logo for a bus company that brings workers to Tamarindo, a beach resort town, from the surrounding countryside shows a cowboy roping a horse. Maybe you thought the pampas was only in Argentina, but we have a lot of ranch land in the Pacific coastal plains of northwestern Costa Rica, which is the province of Guanacaste. Maybe the bus company chose the pampas for its name because it travels through ranch land and picks up people who perhaps in past years would have been working on ranch chores and instead are now working for wages in the tourist industry. The Central Commercial Plaza building in the background is a condominium office building. The business that occupies the front of the second floor is a yoga, pilates and dance studio. Directly above the yoga and pilates studio, on the third floor, is a night club called Bar One. Sorry, but I cannot give a review of either, as I have not patronized either the yoga place or the night club. I went to yoga near our home in Arizona. My wife assured me that there would be other men there. She was wrong. I have a bad ankle from an old tennis injury and I cannot stand on one leg. I could not do much of the yoga. Near then end they told us to lie down on our backs and relax. That part, I could do. I fell asleep. Julie was embarrassed that I fell asleep, but I told her I was merely following the directions very well. She did not ask me to go to yoga again. Today is Sunday, so we have new photos posted on our Viva la Voyage travel photo site. This week we are showing photos of the delightful Majorelle Gardens of Marrakech, Morocco, which were owned for many years by Yves Saint-Laurent. Trees that drop roots into the ground are often called walking trees. The roots seem to progress primarily in one direction so that the tree "walks" along in that direction. 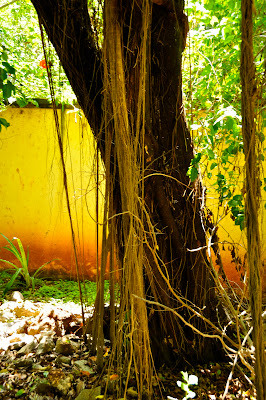 This tree is in the gardens in the courtyard of the Capitan Suizo Resort in Tamarindo. I took the photo from the lobby, looking down into the gardens, which explains the perspective of looking down onto the tree. This week we are showing photos of the architecture of Grenada, Nicaragua on our Viva la Voyage travel photo site. This tree might be a cousin of the tree with walking roots that I showed yesterday. These are not walking roots, as this tree has a strong central trunk, but the tree does drop roots through the air to the ground. The most stressful part of the day -- What wine to select for sunset? 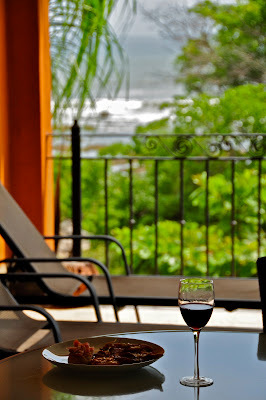 I like to think that when we are in Costa Rica, the most stressful part of the day is to decide what wine to select to await the sunset from the balcony/patio of our Langosta beach condo. We usually select a Malbec from Argentina or another red wine from Chile. We figure that it does not make sense to buy California wines in Costa Rica that we can get easily in the USA. And French wines tend to be more expensive in Costa Rica than Argentine or Chilean wines. Of course, there are causes of stress, even in paradise. Usually it involves the work that we are doing using our USA phone line and internet connection to the office. One possible source of stress in Tamarindo is to make sure that you get gas before you get into town because there is no gas station in Tamarindo or in Villareal, the nearest town. The closest gas station is about 10 minutes inland. This is a view of part of the fountain at the entrance to the Tamarindo Heights development. There are indigenous Central American figures in the foreground, with the Buddhas in the background. This might seem like an odd mixture, but there does seem to be a tropical Southeast Asian decorating trend among the furniture and other features used to furnish some of the condos in Tamarindo. This is a wider view of the area with the Buddhas that I showed yesterday. It is the entrance to the Tamarindo Heights housing development. It is a very large entrance, which I am sure the developers built to impress prospective purchasers, as it would convey the image that the developers have the financial resources to complete the roads and other infrastructure for this project. 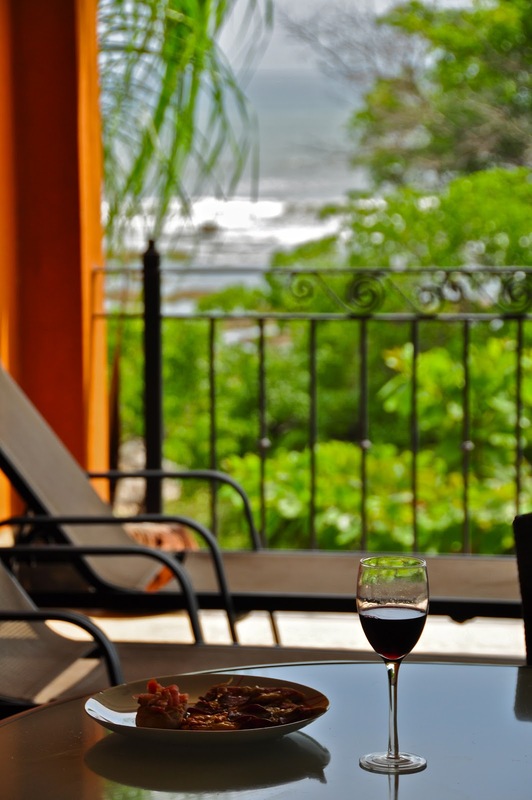 As its name implies, the Tamarindo Heights development occupies the hillside that overlooks the entrance to Tamarindo. There is a guard house at the entrance, which is visible on the left of this circular entrance. I have never been nosy enough to try to talk my way past the guard to see if I can go up there and take photos and check out the development. One of these days I will try to do that. This does not look like Costa Rica. The Buddhas suggest a scene from Southeast Asia, but this is Tamarindo. I will show more of this scene in the next couple of days to place it in context. This photo is a scene not created by nature. Some people have put sand dollars in the flower bed near the area where people can rinse sand off their feet after coming up from the beach before returning to one of the condos in out building on Langosta beach. Yesterday I discussed Costa Rican money a little. And speaking of money, there was an article in the newspaper about a big dispute and government proceeding because a new train line is opening up connecting the capitol of San Jose with the outlying city of Cartago, 16 miles (28 km) away. The dispute is over whether the fare should be set at 550 or 565 Colones. That is the difference between $1.10 and $1.13 USD. I have never heard of such a controversy over three cents. Today is Sunday, so we have new photos posted on our Viva la Voyage travel photo site. 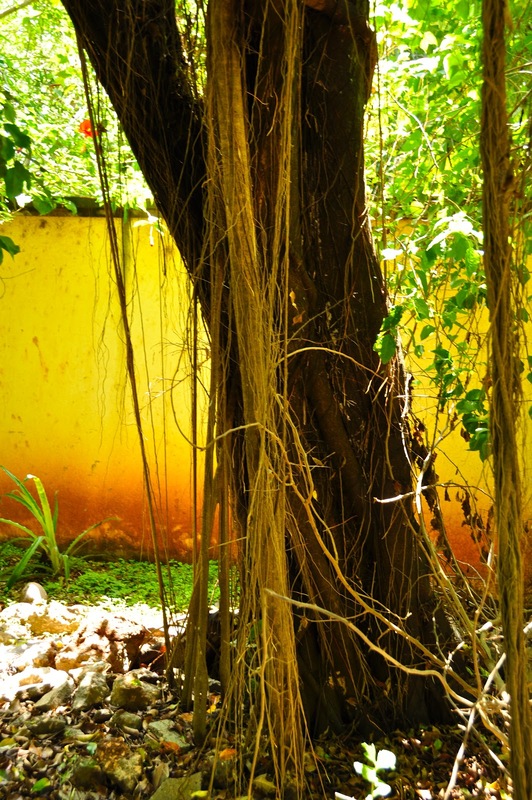 This week we are showing photos of the architecture of Grenada, Nicaragua. This is a sand dollar, of course, although perhaps in Costa Rica they should be called a sand Colones. There are about 500 Colones to one dollar. 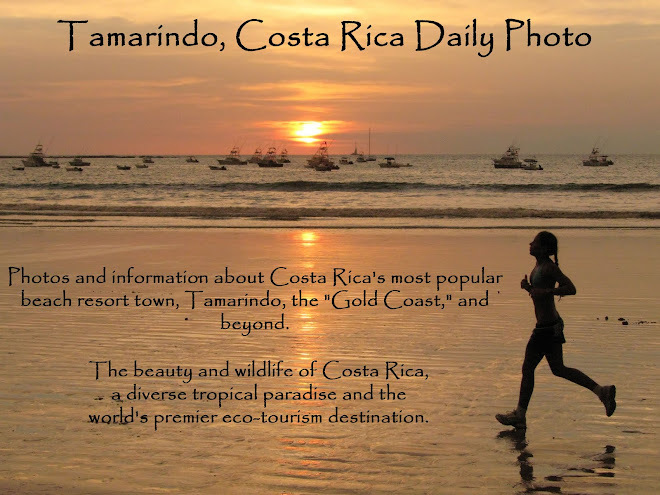 All of the stores, restaurants, and other businesses in Tamarindo will accept dollars. The price tags and menus often list prices in dollars. The ATM machines in Tamarindo even give you the option of taking out cash in either Colones or dollars. This week we have photos of the wild animals of Tanzania posted on our Viva la Voyage travel photo site. Yep. He is a beginner, all right. One arm is pointing up and the other is pointing across his body. Maybe he would say he was not flailing away to keep his balance. He was just trying to signal to someone on shore that he will meet them for dinner at 9:00. Either that or he was flashing semaphore signals while surfing. This surfer does look like a beginner, based on his arms positioned way out to the side to keep his balance. Let's see how he does in tomorrow's photo. Sometimes I post photos of surfers. Sometimes I post photos of sunsets. And if I can't decide which, I guess I could post photos of surfers at sunset. This photo certainly shows why they call our area the Gold Coast. This photo was at the southern end of Tamarindo Bay, where the waves are gentle because of a reef and island that shelters this end of the Bay. Why would people surf in the gentle part of the Bay? Perhaps they are beginners. We will check during the next couple of days. Sometimes surfers ride their waves to the shore, sometimes they wipe out, and sometimes they decide to turn out and cut a ride short and catch another wave. I don't surf, so I can only surmise that this surfer decided that the rest of the ride on this wave would become tamer than his preference, and he cut short his ride in anticipation of a better wave. Picky. Picky. Picky. Here is a surfer who has caught a good sized wave on Playa Langosta. As usual, I will show the outcome of this ride tomorrow. The afternoon and sunset sail excursions from Tamarindo bay are popular with visitors. 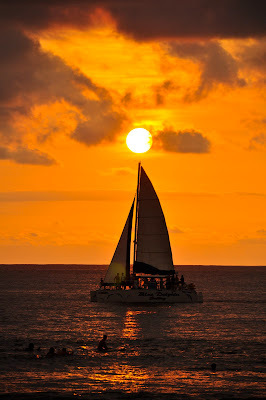 This is the sunset sail boat as it is returning from its excursion. I like to sail. When I was in high school in St. Louis County, Missouri, I was a Sea Scout, which is part of the Boy Scouts, except we learned about and went sailing instead of camping. We sailed in a wide part of the Mississippi River just above the Alton Lock & Dam. We had to stay out of the way of the large and frequent barges. I think sailing in the Pacific off the coast of Tamarindo is much better. Today is Mother's Day in the USA, but not in Costa Rica. Mother's Day in Costa Rica is in August, and it is a national holiday. People get off work and many businesses are closed. Today is Sunday, so we have new photos posted on our Viva la Voyage travel photo site. This week we are showing photos of some of the wild animals and a coffee plantation in Tanzania, Africa. 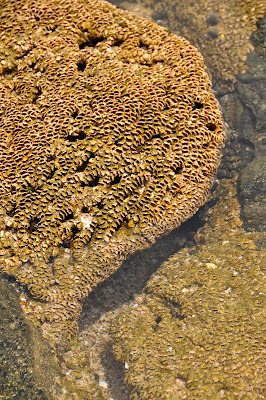 You never know what you might find looking in the crevices and tide pools along the beach. This attracted my eye, as I initially thought it was a berry, but it appears to be an unusually colored stone or piece of coral. This week we have photos of street scenes of Marrakech, Morocco, posted on our Viva la Voyage travel photo site. This is a closer view of a portion of the mossy area along Langosta Beach. There was an article in the Tico Times this week reporting that Costa Rica continues to be the most popular destination in Central America for tourists from Europe, and European tourism to Costa Rica was up 16 percent last year. Hopefully that will lead to more direct flights from Europe to Costa Rica, which would bring even more tourists by making it more convenient than changing planes in the US or Panama. This is another view of a mossy patch that changes the pattern of sand and volcanic rocks under the surface of Playa Langosta at low tide. I don't know why, but in a couple of spots along Playa Langosta there is moss covering the rocks, unlike the vast majority of the beach that has sand or volcanic rock without moss. Of course walking across the damp moss is rather tricky. We stay up on the sand and walk around the mossy patches. Here is another view of the coral or shell encrusted rocks on part of Langosta beach. I don't understand why there are certain places where certain types of shells or coral congregate, but there is quite a diversity of sights on a walk on even a short stretch of the beach. 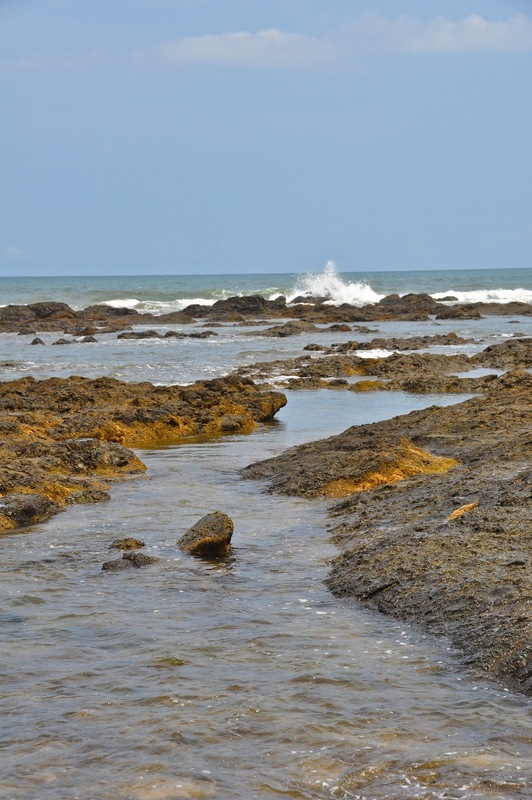 The tide pools along Playa Langosta provide a wide variety of shells, coral, rocks and marine life. This appears to be coral or shells covering a rock that is submerged at high tide but is exposed at low tide. This is a view of some of the rocks at San Francisco point. A wave has crashed on one of the rocks in a way to send its spray airborne. Today is Sunday, so we have new photos posted on our Viva la Voyage travel photo site. This week we are showing photos of street scenes in Marrakech, Morocco. This photo shows the volcanic rock that is under the water at high tide and that provides a locale for tide pool exploration at low tide. This is near San Francisco point, which divides Langosta from Tamarindo. This week we have photos from the bottom of the Grand Canyon, including a photo of the endangered chubb fish, posted on our Viva la Voyage travel photo site. This is a wider view of the type of sand and rock patterns that I showed yesterday. The ocean floor under the water at Playa Langosta is the remains of a volcanic lava flow. There is dark volcanic rock that is under the water at high tide, but is exposed at low tide. In some parts of the beach, the volcanic rock forms tide pools to explore. 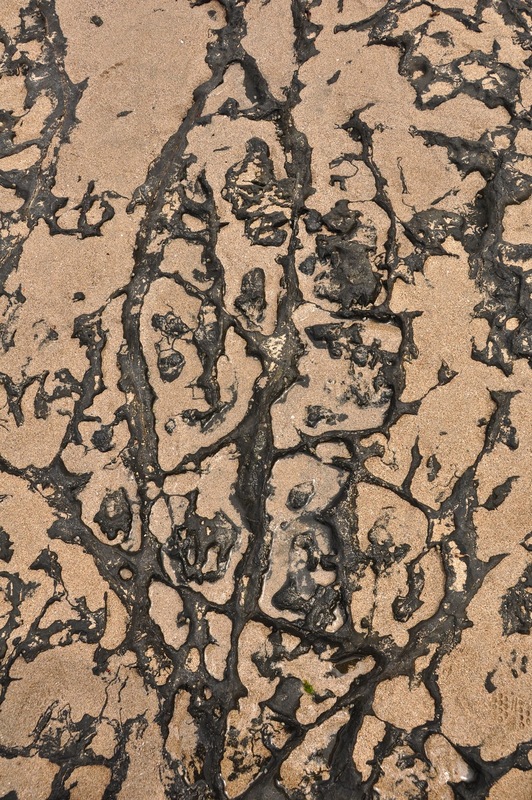 In this location, sand has gathered to fill in the low spots in the rock, leaving the ridges of the volcanic rock exposed in these patterns. Welcome to Costa Rica, President Obama! Later today President Obama will arrive in Costa Rica for a quick visit. He will hold meetings with Central American government and political leaders in the capitol of San Jose. Hopefully this will lead to enhanced economic opportunities for all countries in the region. He is the first AMerican President to visit Costa Rica since President Clinton nearly 20 years ago. After yesterday's photo of a crab making patterns in the sand, I thought I would show another photo of patterns in the sand. I will explain this with a wider view tomorrow. Today's world-wide City Daily Photo theme is "The Creative Artisan." I like to showcase distinctly Costa Rican interpretations of the Daily Photo themes, such as last month's photo of monkeys crossing the street for the theme of pedestrians. So, today I am stretching the interpretation of the theme by choosing a photo that shows the artisans of mother nature. These artistic patterns in the sand are a work in progress by tiny crabs that crawl beneath the sand and leave little piles of sand pushed up in their tracks. 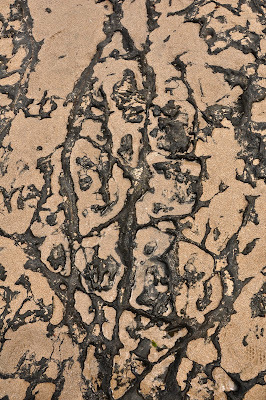 This process reminds me of a miniature, abstract version of the Nazca Lines in Peru. My son, Stuart, has even taken a video showing these little lines as they are being created. It is not exactly a high drama, action sequence. To see how other City Daily Photo bloggers have interpreted the theme of artisans at work, click on this link.